Lewis County (New York) is located in the north central part of New York State bordering the Adirondack Mountains on the east. The Mennonites are found in the central part of the county in and around the villages of Lowville and Croghan. In 1955 there were approximately 800 Mennonites in Lewis County and about 50 members living near Woodville in Jefferson County, an adjoining county. The First Mennonite Church (MC), organized in 1941, is located at New Bremen and had 193 members in 1954. The two older Conservative Amish Mennonite churches with a combined membership of about 600 are located near Croghan and Lowville. The first Amish Mennonite settlers came to Lewis County from Alsace-Lorraine in June 1833. One of the first to arrive was Michael Zehr. Among the families who arrived soon after were Martin, Moser, Steria, Nafziger, Lehman, Farney, Virkler, and Kennel. For a history of the Amish Mennonite community, see Lowville Conservative Mennonite Church. Zehr, B. F. "Lewis County (New York, USA)." Global Anabaptist Mennonite Encyclopedia Online. 1957. Web. 23 Apr 2019. http://gameo.org/index.php?title=Lewis_County_(New_York,_USA)&oldid=95780. Zehr, B. F. (1957). Lewis County (New York, USA). Global Anabaptist Mennonite Encyclopedia Online. 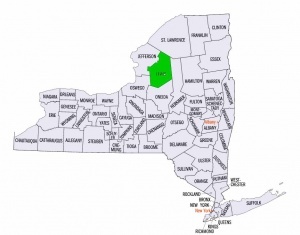 Retrieved 23 April 2019, from http://gameo.org/index.php?title=Lewis_County_(New_York,_USA)&oldid=95780. Adapted by permission of Herald Press, Harrisonburg, Virginia, from Mennonite Encyclopedia, Vol. 3, p. 330. All rights reserved.